JULIE PFLEIDERER IS A GERMAN DIRECTOR WORKING ACROSS THE BOUNDARIES OF PERFORMANCE & EXPERIMENTAL FILM. In her work Julie Pfleiderer explores the border of documentary and fiction. She is interested in the shift where fiction becomes truth and truth starts to be fictional. Julie enjoys collaborative processes where different media and approaches are put in dialogue to create friction out of permanent differentiation. Julie Pfleiderer was born in Duesseldorf, Germany. After her graduation, she worked as press assistant for German TV channel ARD and learned how to edit films in a video production company. Moving to Cologne, she assisted 2 years for 9 directors at Schauspielhaus Köln. Moving to Berlin, she studied theatre directing at Hochschule für Schauspielkunst Ernst Busch. While studying in Berlin, she directed 2 performances at Café Altes Europa in Berlin Mitte. Her production “Richard 3” from 2005 was invited to several festivals – 100 Grad HAU Berlin, Festival Premières at Théatre Le Maillon, Strasbourg, Körber Stiftung Junge Regie Hamburg. After her diploma “Liliom” by Franz Molnar, Julie directed 3 shows at Staatstheater Mainz: “Kopftot” by Gerhild Steinbuch (2006), “Amokläufer – Miniaturen der Gewalt” (2007) and “Menschen in Kindergrössen” by Gerhild Steinbuch (2008). Her show “R. Destillat” (after the film “Rosetta” of the Belgian film directors Jean-Luc and Pierre Dardenne) was invited to “Freischwimmer Festival 2008” and shown at Sophiensaele Berlin, Kampnagel Hamburg, Gessnerallee Zurich,FFT Duesseldorf, Brut Vienna and Pathos Transport Theater Munich. For her productions “Kopftot” and “R. Destillat” Julie was nominated as “Nachwuchsregisseurin 2006 and 2008”/ “Best talented young director in 2006 and 2008” by the German theatre magazine Theater Heute. Between 2005 and 2009 she also worked at Schauspielhaus Vienna, Staatstheater Stuttgart, Deutsches Theater Berlin, Maxim Gorki Theater Berlin, Schauspielhaus Wuppertal and as directors assistant of Belgian artist and choreographer Jan Fabre for his production “Requiem für eine Metamorphose” at the Salzburger Festspiele 2007. Since 2009 Julie lives and works in Berlin and Brussels. In 2009 Julie participated in APASS – advanced performance training in Antwerp, Belgium and was part of DE THEATERMAKER Antwerp, Belgium – a platform for young theatre makers. In 2010 Julie was invited by Matthias Lilienthal to create an audio walk at “DONG XUAN FESTIVAL oder Fruehling in Lichtenberg” at HAU Berlin. her video installation “Serious and catastrophic” and the intervention “Collapse – Not the end (Scherzo) based on Cornelius Cardew`s`”Treatise” were shown at BURNING ICE FESTIVAL Kaaitheater Brussels. Her larger work “Am Schönsten ist das was bereits verschwunden ist” was created in 2011 at Steirischer Herbst Festival Graz, Austria. It contains 5 audio walks leading to a performance in collaboration with Gerhild Steinbuch, Philine Rinnert, Alexander Schellow and Noid. In 2012 Julie collaborated with German performance artist Anne Tismer and Italian stage designer Silvia Albarella in “NON TUTTA” at Sophiensaele Berlin and FFT Duesseldorf. She also curated her first festival: SOUNDLAB#3 – Seeing Sound, together with Caroline Daish in Brussels. The curators invited 10 sound artists to give lectures and audio walks for the 2 weeks festival. In 2012 she got in contact with Bruno Pani, CEO of Profirst Brussels who invited her to become Artistic Director for 6 videos for fashion brand Zara. After that Julie collaborated with Liganova, Stuttgart on projects for Porsche and Louis Vuitton. In 2013 she directed fashion video clips for fashion designers/ brands as Jean-Paul Lespagnard, Emporio Armani, Massimo Dutti, Weekend Fashion Award Brussels and Eastpak as Creative Director for Profirst, Brussels. In 2014 she collaborated with Jean-Paul Lespagnard on the concept and realisation of his first solo exhibition at Galerie des Galeries/ Galeries Lafayette Paris and created a video about the exhibition for Galerie Lafayette. The video was shown in the exhibition, on TV5 and France 24. In 2014 Julie co-directed the performance “For Your Ears Only” together with Australian actress Dianne Weller and won the Special Jury Award for Experimental Short Film at the Film Festival in New Orleans USA for “Infinite Jetzt”. “For Your Ears Only” premiered in February 2015 at Beursschouwburg, Brussels, Belgium and is coproduced by Pianofabriek Brussels, BUDA Kortrijk, Vooruit Gent and Monty Antwerpen. 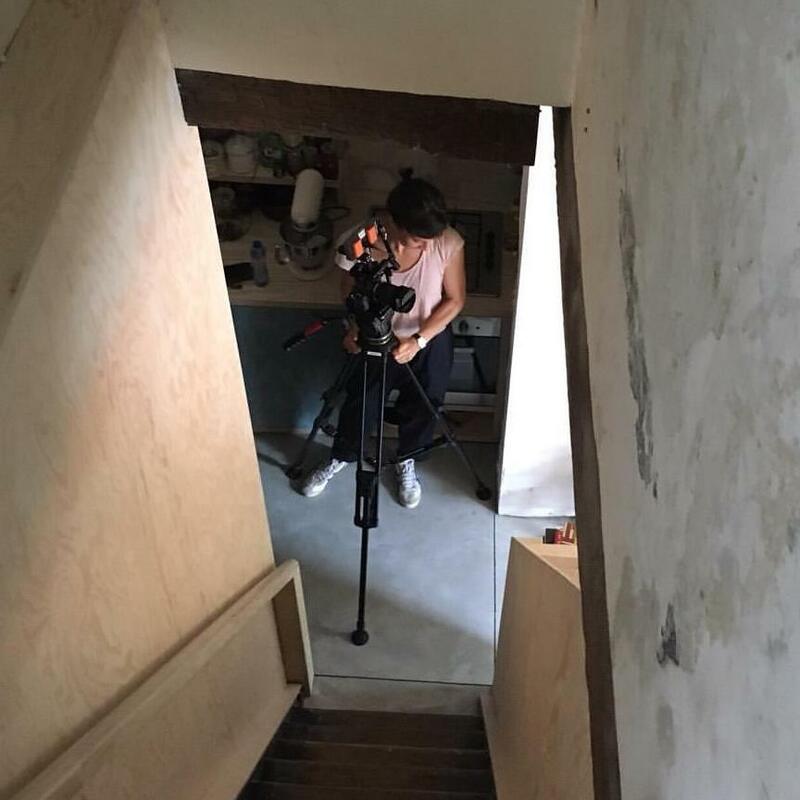 In 2015 Julie directed the trailer for the performance “A Possibility of an Abstraction” for visual artist Germaine Kruip and created 6 films for the festival “Performatik” at Kaaitheater Brussels. She also directed her first commercial video for Wildling Shoes, a 2 min and a 30 sec version. Her short film “Infinite Jetzt” was shown at s:in festival for performance and video art / instants vidéo in Ramallah, Palestine in July 2015. In November 2015 Julie directed the new performance “Jetzt aber später” with actress Angelika Krautzberger in collaboration with the band Colorist. The performance took place in the former striptease club King Georg in Köln and was episode II in the frame of DIE STIMMEN DER DINGE I-IV. In 2016 Julie directed the architecture film ACTUAL SIZE REAL TIME #1 PARTIAL VIEWS together with Miriam Rohde. The film was shown in Project Space St’Anna in the context of the Venice Architecture Biennale 2016 and a film for a contemporary music concert in Tallinn, Estonia, together with composer Oxana Omelchuk and musician Florian Zwissler. In 2017 Julie collaborates as media artist with dance company Fieldworks on their new production ‘unannounced’ that premieres at Kaaitheater Brussels, Belgium in April 2017 and tours to Belgium, Sweden, Norway and Germany and creates a film together with visual artist Marcel Buehler, shot in Berlin, Germany, NYC and Arizona, USA. In 2018 Julie was fellow at Villa Aurora, Pacific Palisades, Los Angeles for 3 months. She is directing the performance SAFE in collaboration with actress Caroline Daish, composer Oxana Omelchuk, choreographer Christine De Smedt, writer Pieter Delfosse, stage desiger Jochen Schmitt and Ictus Ensemble. Premiere will be November 2018 at Kaaitheater Brussels. There is also a new video coming out for Wildling Shoes, shot in Corsica, France. Julie Pfleiderer lives and works in Berlin and Brussels.